The 12-lead ECG is a vital tool for EMT’s and paramedics in both the prehospital and hospital setting. 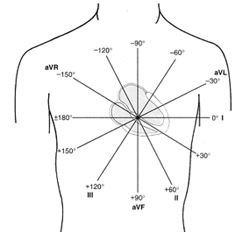 It is extremely important to know the exact placement of each electrode on the patient. Incorrect placement can lead to a false diagnosis of infarction or negative changes on the ECG. Up to 50% of cases have the V1 and V2 electrodes in a more superior location, which can mimic an anterior MI and cause T wave inversion. Up to 33% of cases have the precordial electrodes (V1-V6) inferiorly or laterally misplaced, which can alter the amplitude and lead to a misdiagnosis. The ECG leads are grouped into two electrical planes. The frontal leads (Lead I-III, aVR-F) view the heart from a vertical plane, while the transverse leads (V1-V6) view the heart from a horizontal plane. One of the most common questions regarding a 12-lead ECG is why there are only 10 electrodes. It’s important to fully understand what the term “lead” actually means. A lead is a view of the electrical activity of the heart from a particular angle across the body. Think of a lead as a picture of the heart and the 10 electrodes give you 12 pictures. In other words, a lead is a picture that is captured by a group of electrodes. The heart’s electrical signal is very small and unfortunately this can be combined with other signals of similar frequency to create artifact. It’s not uncommon for 12-lead ECG’s to have some form of artifact; however, it’s important to try to reduce any interference to ensure an accurate ECG. Below is a list of guidelines that will help reduce artifact when performing ECG’s. Place the patient in a supine or semi-Fowler’s position. If the patient cannot tolerate being flat, you can do the ECG in a more upright position. Make sure the patient’s legs are uncrossed. Move any electrical devices, such as cell phones, away from the patient as they may interfere with the machine. Dry the skin if it’s moist or diaphoretic. Shave any hair that interferes with electrode placement. This will ensure a better electrode contact with the skin. Rub an alcohol prep pad or benzoin tincture on the skin to remove any oils and help with electrode adhesion. Check the electrodes to make sure the gel is still moist. Do not place the electrodes over bones. Do not place the electrodes over areas where there is a lot of muscle movement. Visit the ECG section to learn how to interpret 12-lead ECG's and identify the different types of heart rhythms. Another paramedic placed leads directly over pts breast instead of under breast..
We’ve also encountered this in the field a few times; however, the AHA recommends that precordial electrodes are placed under the breast tissue on female patients. It’s important the electrodes are placed in the proper anatomical position and this can be difficult when placing above the breast. In addition, it’s unlikely that an ECG with electrodes above the breast would be as accurate or reproducible since breast tissue is prone to movement. I encourage you to try both ways. You will find that breast tissue does not cause changes in morphology or add artifact to the EKG. Lead placement is crucial and some breasts can force you to place some precordial leads closer to the stomach than the heart! Good luck. I also recommend that you try the over-the-breast method. I work for cardiology and we are always told by the cardiologists the particular method that they prefer. More often than not they suggest placing the electrodes on top of the breast, when the breasts are larger – and we get the same ECG results and accuracy both ways. However, if the patient is experiencing marked tremors or shivering, they suggest placing the electrodes under the breast to reduce artifact. But as I said, in everyday circumstances – and when it is vital to get the 12-lead immediately – on top is perfectly acceptable. Actually my experience is contrary to this. I was taught by a professor of cardiology that under no circumstances should you place v4 and 5 on top of the breast, it must always go under. Placing it on top can result in it being too high, giving the impression of anterior elevation/depression, where there is none. It can also result in greater levels of movement and artifact. Thank you so much!!! I’ve been puzzling over why there are only 10 electrodes in a 12 lead ECG for hours! You explain it much better than my med school book does… I quoted your article on my site and credited you, hope it will clear up the confusion for other confused medical students like me! We’re glad you found this article helpful and we appreciate the quote on your website. We wish you the best of luck in med school! Find the bottom of the sternum then place two fingers horizontally superior to that. Then from the top of those two fingers go horizontally to the patient’s right until you feel a rib, which should be the 5th rib. The space directly superior to the 5th rib is the 4th intercostal space where you place V1 slightly lateral to the Sternum and not touching the sternum. Then Place V2 directly opposite on the patient’s left side of the sternum. In pre-hospital and hospital settings I have been taught to use my fingers. Placing the thumb on the clavicle and extending the remaining four digits to find the 4th intercostal space. I find it a bit conflicting with my hand size and the information provided here. Can you help. Have you ever had a patient complain because you were using your fingers to find the intercostal space? My administrator says I’m setting myself up for a lawsuit but I’ve been doing ECGs this way for 30 years!! Do the electrode tabs (we’re using alligator clamps) all have to face the same direction (ie with the tab attachment to the alligator facing down)? One MA puts the leg tabs towards the head so the wires don’t pull. Not sure if this makes a difference? BTW: excellent article, great tool for teaching. Great question and thank you for the compliment. As far as we know, the electrodes do not have to face the same direction. In fact, the MA’s placement technique is actually a good idea since it’s preferred to have less tension on the wires. This allows for a better electrode connection and keeps the alligator clips from slipping. Debbie, I am an MA student graduating this week, and I was taught that the electrode tabs on the legs point toward the patient’s head, and that all other tabs point downward towards the toes. This helps with the wires not pulling and making the tabs come off the patient, and I was told it also helps the EKG have a better read. I don’t know if these are the actual reasons why, but this is how I place electrodes when I do EKGs. Good article with points that are hitting the nail on the head. Educative. As an educator I have referred individuals to your link because it is explained in such simple terms. I am wondering if you would consider adding education on placement for right sided EKGs. Thank you. Thanks, Laurie! Yes, this is definitely something we can start working on. I am actually getting ready to start a medic course soon i am wondering if you have any suggestions for memorizing lead placement as well as the various rythms for when i amd taking ACLS and PALS. If you could e-mail me some suggestions i would greatly appreciate it. That’s great news and we just sent you an e-mail with some tips and suggestions! I am in the same situation as Thomas Hood. Could I please request similar tips and suggestions regarding EKG lead placement and interpretations? I sincerely appreciate it. Can I get the same information as the above 2 individuals emailed to me too, please? I appreciate your time, and I’m glad I found your website. I have recently finish a course as a EKG Technician. Now it is job hunting time. Every place I have look want 12-24 month experience. Do you have any ideal or where I can go to get work experience or what I might ask to get employment. I would be so happy. Martha, hopefully you have found employment at this point. If you are still looking, you may want to try a temp agency. They may be able to help place you someplace for a bit in order to gain the required experience. Best of luck to you! Apparently incorrect lead placement is occurring frequently in the primary care physician’s office also. I recently had an EKG done and was referred to a cardiologist all due to poor tech. I also paid copays, & the ins. company paid for unnecessary medical expense. I will be in contact with the PCP to report this mishap & suggest some remedies to avoid what happened in the future. 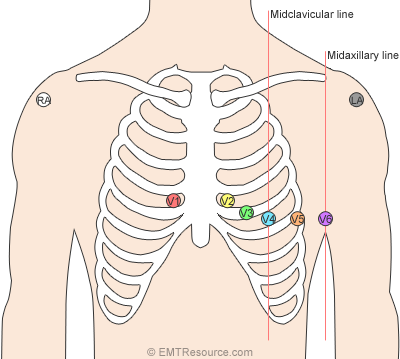 What are the consequences if one mis place the chest leads like for example one puts v4,v5,v6 on the forth intercostal space? Superior (above the 5th ICS) or inferior (below the 5th ICS) misplacement of V4-V6 can lead to changes in wave shape and amplitude. Nice source..can i just ask..why is there a need to unbuckle belts and remove coins/dimes from the pocket of the patient..thanks.. Interesting question and we’ve never heard of this before. Our first thought was the metal might interfere with the ECG; however, after doing some research, we couldn’t find any sources stating that you need to unbuckle belts and/or remove coins from the patient’s pocket. As far as we know, this is unnecessary and shouldn’t have an impact on the ECG. Is it necessary to remove underwire bras and wrist watches/bracelets for an EKG? It’s generally a good practice to remove or unstrap all bras to ensure proper placement of the precordial leads. As for watches and bracelets, these items should be okay and can be left on the patient. I was taught by a Cardiologist that i can place RAL LAR on the back of the hands, and alos the other limb leads on each side of the stomac, Is this correct? I hate to over step a Dr. I was just wondering why you shouldn’t place any of the electrodes over bony prominences? Is it because the electrical impulse isn’t read as easily? Correct — Bone isn’t a good electrical conductor, so it’s best to avoid it. In addition, muscle movement can be increased when placing electrodes over bones. This movement can then cause a wandering baseline on the ECG. I too was shown that the limb leads can be placed on back of hands or shoulders and on each side of the stomach. can you clarify if this will cause a misleading interpretation? I teach a medical assistant class and the students have a hard remembering the lead placement for 12 leads as well as Holter monitors. Any suggestions or mnemonics you’re aware of? I am just wondering how accurate an ECG result is if the technician placing the leads failed to place leads below the waist? A diagnosis was made and treatment recommended based upon the reading done without lower extremity leads. How concerned should I be and would you recommend getting another test done properly or requesting a second opinion? Thank you so very much. I’d sure like the answer to that one, myself. I am wondering if you have any suggestions for memorizing lead placement as well as the various rhythms for when i and taking ACLS and PALS. If you could e-mail me some suggestions i would greatly appreciate it. I also just started in a Cardiology position, and any information that you could give me would be awesome. Thank you. This is a great site! Excellent article-very concise and educational. I work for a company that can derive the 12-lead EKG (technically we can do 15-22 leads-posterior & right heart in Europe). using only 5 electrodes. V2 and limbs. Would you find this beneficial? We recently won the EMS World Expo Innovation Award. I’d be interested to hear your feedback. Thanks again! One other question – Above you state “Up to 50% of cases have the V1 and V2 electrodes in a more superior location, which can mimic an anterior MI and cause T wave inversion.” Do you have a reference for that? Thanks. I currently work as a paramedic in the field and was taught if the patient has poor circulation in the legs you will not get an accurate 12 lead reading, to move the limb leads to the abdomen. Is this true? What does poor circulation have to do with a 12 lead reading? Any suggestions for memorising various rhythums for when I do my ACLS/PALS. Thank you….this is a very helpful site…..lots of good tips. Hi where should v3 be placed on a woman. On or under breast. I always place v4-6 under breast but havent been with v3 as this then wont be in the middle of v2 and b4. Should all leads be under the breast? Recently had a 12-lead done by a tech where they placed the upper limb leads just above the antecub and v1 and v2 on the right and left shoulder with v3 and v4 at about the 5th intercostals then v5 just below V4 and v6 under the breast midclavical. The EKG was interpreted as an anterior MI resulting in a repeated EKG being done to get clearance for surgery. Is it reasonable to assume the described placement resulted in an erroneous tracing? How would you place the leads on a side lying patient who is unable to turn to their back side for whatever reasons? Can the leads still be placed on the patient in this position? We did find that with some machines watches, a lot of change, big metal belt buckles, a cell phone with power on- even in receiving mode-not being used for talking, could all interfere with a good ECG- I have also heard of an office where the technician actually held an electrode tab in place by putting her finger on it, which I would fear would cause the machine to pick up data on her. I have seen times where the lead wires have been held to keep them from putting a twist on the tab causing it to be less secure, but I would think with the insulation there that would be less likely to cause a problem-thoughts on these 2 practices ? Sometimes it is very hard to find really good sticking tabs. So I’m wondering what difference it makes to ensure the patients legs are not crossed? I’ve come to the conclusion that most people who do ekgs shouldn’t, and that most people who claim to be able to read them, cannot. There’s a lot at stake here. Lead placement is an important aspect. HELP! How does one place leads on a morbidly obese patient consistently? We’re doing a clinical trial that requires ECGs and could not be read reliably by a central reader. Any help here? This website is Awesome. I am taking an EKG.class and this is where I seem to really be stuck. Counting from the clavicle to the inner spaces for the leads placement. I take the board in less than a month. I am nervous about getting the EKG placement of leads.. I think it may be important in the above placement chart to stress that the limb leads, particularly the arm leads, need to be placed at the at the same vertical level (that is, the left arm one should not be nearer the shoulder and the right arm nearer the elbow). Also, I am wondering if it should be stressed that the arm leads should be placed closer to the shoulder. If the arm leads are closer to the elbow then I wonder if they may be at or below the atrium of the heart, and if this could result in less optimal superior/inferior electrical views of the heart (such as in leads II, III, aVF, and aVL). I have a questions regarding placement of electrodes. I saw today that a technician placed the RL & LL at the wrist of patient. Is that correct? I have 2 questions please help me. 1: why there is 12 leads in ECG? 2: why QRS wave is deeper and P is wider? Please email me any info regarding 12 lead placement and ideas for remembering. This site is 100% educational. Say it clockwise as you look at the patient. Why are there only three “leads”? Lead I,II,III relate to RA,LA,LL but says nothing about RL location lead. I am very confused as to what these white,green,black,red leads have to do with the V1-V6 lead placements. I know where they all go on the patient’s body, but do not understand how these work together. Thank u for reading/any responses in advance. Does it effect the accuracy of the interpretation if the limb leads are placed on the trunk (near each shoulder and bottom of torso? can you send me the same tips and suggestions that you send the others on leads placement and how to memorizing the color and the different rhythms. Very helpful, when reading thru the conversations and comments. Should there be any interesting things popping up about ECG reading or interpretations,may I be emailed about it.